Curtains that are sewn together in the conventional way are sturdier and last longer but serviceable, unlined lightweight curtains can be made with no sewing at all. A modern bonding web (Bondaweb is probably the best well known, but there are others) is applied with a hot iron and a damp cloth and takes the place of a needle and thread. There are a number of curtain heading styles which are suitable for no sew curtains. These include, cased headed, eyelet, heading tape and curtain clips. If more than 1 width of fabric is required in each curtain a bonding strip can be used to join the widths together. This is the easiest way to hang curtains. A double hem is formed at the top of the curtains to which clips are applied and hung from a narrow pole or curtain wire. There are numerous designs and finishes of curtain clips available to blend in with your existing décor. Decide whether you would prefer a wire or a pole and fit it above the window in the chosen position. Measure the wire or pole and multiply by the fullness ratio (at least 1.5), allowing 1.5” (3.75 cms) for side hems. Divide this figure by the width of the fabric to be used and round up to the next whole number. This is the number of widths required. Measure the length. Remember the length of the clips must be taken into consideration when estimating the finished length. 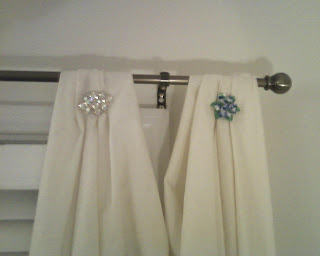 To do this, thread the curtain clips onto the wire or pole and measure the finished length from the top of the clip. To calculate the cut length, add 4” (10 cms) for the bottom hem allowance plus 4" (10 cms) for the top hem. If patterned fabric is used, extra will be needed for pattern matching. To calculate the amount of fabric required, multiply the number of widths by the cut length. Lay the first cut length on a flat surface, right side up, and place 0.5" (12 mm) strip of bonding web along the selvedge edge that is to be joined. Turn in 0.5" (12 mm) seam allowance down the selvedge of the second cut length and press. · Place the second length on top of the first length, right side up, with the seam allowance over the bonding strip, matching the pattern on the fabric if necessary. · Press with a hot iron over a damp cloth to seal the seam. · Join other cut lengths in the same way, if necessary. Make sure to add any half widths to the outside edge of each curtain. Turn in 0.5" (12 mm) and then another 1" (2.5 cms) at each side edge and press. Place a bonding strip, 1" (2.5 cms) wide and the length of the curtain, under the fold and press in place with a hot iron over a damp cloth. Turn up 1" (2.5 cms) and then another 3" (7.5 cms) at the lower edge. · Place a bonding strip, 1" (2.5 cms) wide and long enough for the width of the curtain, under the top fold of the hem and press with a hot iron and a damp cloth to seal. · Turn down a double 2" (5 cms) hem at the top edge and pin. Check the finished length of the curtain and adjust if necessary. · Place a bonding strip, 2" (5 cms) wide and long enough for the width of the curtain, under the top fold. · Press with a hot iron and a damp cloth to seal the hem. 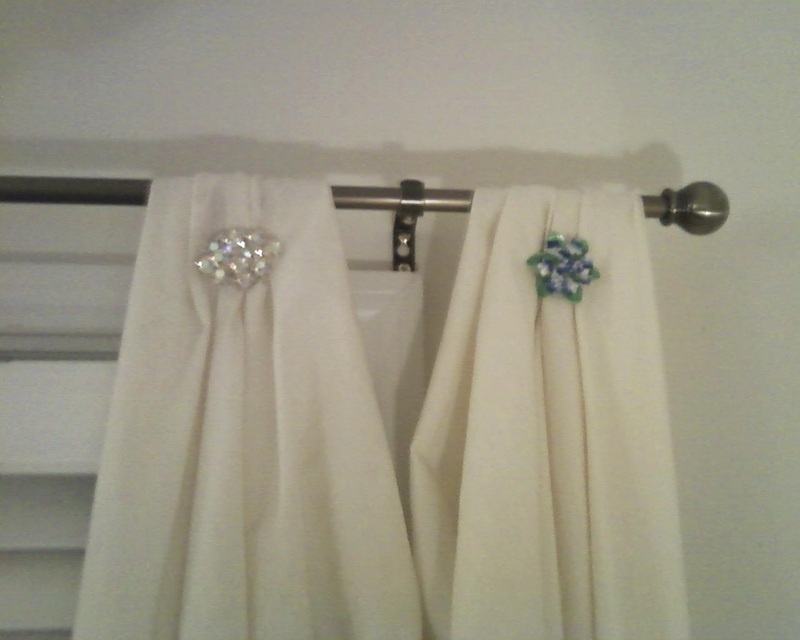 · Attach the curtain clips to the top fold and hang the curtains.